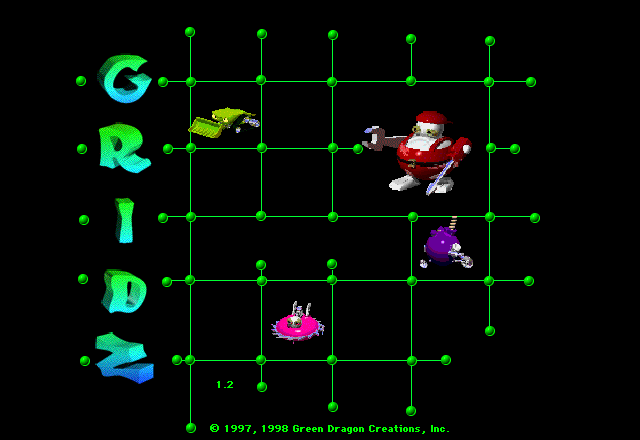 Gridz is also a strategy game, of course, and a clever one. Real-time strategy games have an element of territory control underlying them. Gridz makes that aspect explicit. 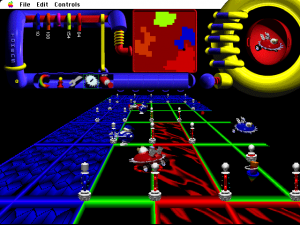 The physical control of NetSpace has a mechanical role in the game, and Gridz supports the idea with the unfamiliarity of its juiced-up cyber setting. The primary instruments of control in the game are the Gridz, square units of territory on the game’s wireframe map. As players claim more Gridz, they gain energy to build robots. More critically, the Gridz define what chunk of the map is yours. Other players can see inside that zone but can’t enter it. Turn-based wargames like Civilization set out boundaries like that, but for a strategy game played in short rounds of action, Gridz is a bit unique. Matches in Gridz are waged against the map, not against individual units. (And barely even against individual players.) Your objective is to knock out the other players by taking over their Gridz. You can build three varieties of robots: two of them – Builders and Hackers – affect the Gridz territory, and only one (Strikers) actually fights people. The game codifies control of the map as its most valuable resource. The purpose of any action you take is either to gain it, destroy it, or protect what you already have. The first few moments of each match send players into a frenzy to stake out as much of the map as they can – though wisely, later versions of the game prevent you from taking portions you can’t immediately use. The need for that revised mechanic speaks to the peculiar central role Gridz have in this game. Could this kind of territory game have played as well with any other theme? If it was based around aggressive real estate developers or something, it would still need to work hard to justify its unusual mechanics. The weird internet robot future of Gridz needs no explanation. You place Nodes in NetSpace to expand your Gridz. Sure! It doesn’t have to follow rules for a familiar setting. It’s basically magic. It can come up with whatever, and it fits. There’s a certain level of awe behind every depiction of the far future, even the ridiculous ones, and that gives Gridz confidence. It has the self-assurance to pull off questionable stylistic choices, like an angled view window so narrow you can’t see much of the map. Or a decorative ring so massive that it cuts into the Macintosh menu bar. They get to be, simply, cool. Look at the amazing menu screen. The deep red, yellow, and violet and the machinery, simple yet ornate, spinning around with no purpose. What is this beautiful and mysterious thing? Gridz has to have come from some other dimension ruled by kid’s toys. That would certainly explain the ToolBots, the robot sidekicks you create to capture the Gridz. Their mishmash of remote-controlled cars, power tools, and wind-up bugs could have wandered out of Sid’s doll butcher shop from Toy Story. They’re so neat to play with. And they have cheesy catchphrases! (“Don’t I just cut you up?” says Buzz the buzzsaw.) Spec the two-legged turbine is a hero just for coming along. Gridz is free from convention, but the emphasis on territory can only carry it so much. The game has a persistent upgrade system for unlocking more effective ToolBots, which adds an interesting strategic choice about whether you want to expand quicker or fight better, as well a sense of gradual escalation across many rounds. But once you figure out how to monopolize the game’s single resource (you get land, you get energy, and then you get more land), Gridz is awfully easy to win against the computer. The AI never acts as aggressively as a game about land expansion demands. That limitation would be fixed against human opponents in multiplayer. Oddly, the multiplayer mode also has features that broaden the game’s dynamic, like alternative victory conditions that don’t involve destroying everyone and the ability to sacrifice upgrade tokens for energy. Possibly from limits to what the AI can handle, one of the game’s big weak points, none of these come to the single player. It’s still quite a rad proof-of-concept. Anything that moves like Gridz would be worth playing regardless. Wow thanks for reminding me that this exists. 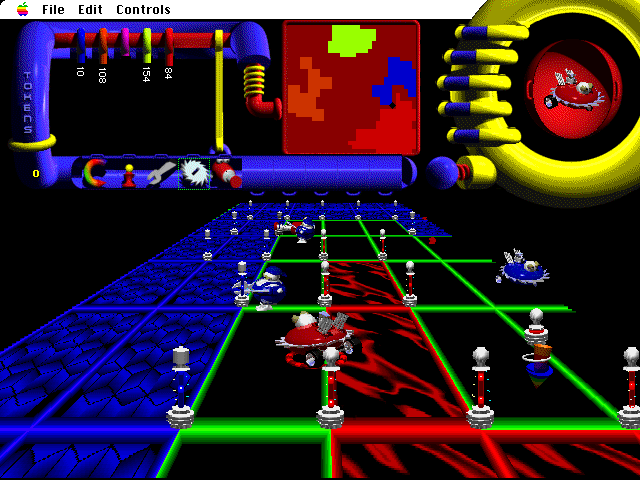 Played this a bunch as a kid, haven’t though about it since the 90s. Now add to your “futuristic” tag with Jump Raven (Mac version is supposed to be better btw)! Nice article. I’m currently re-writing Gridz (based on my code from 20 years ago) for iOS. No timeline yet, but it is happening. @Howard this is exciting news! I hope it’ll be in app form as well as desktop!